Print Awareness - How Many Letters? Print Awareness encompasses many different forms. 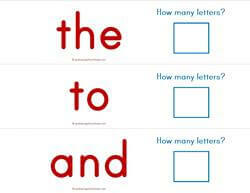 This section of resources focuses in on the fact that we put letters together to make words. Some of those words are big words (have more letters and letter sounds) and some words are smaller (have fewer letters and fewer letter sounds). 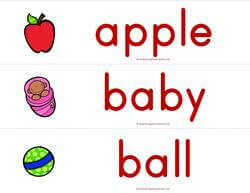 Kids can get lots of vocabulary and counting practice by counting how many letters are in each word. There are two kinds of worksheets on this page: cut and glue sorting worksheets and counting worksheets. You’ll also find lots of pocket chart cards and word strips. All these resources are based on animal words, number words, color words, Dolch preprimer words, and Dolch nouns. 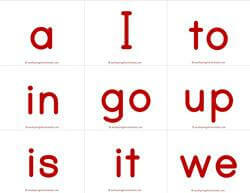 All have the same objective – how many letters are in each word. Here’s a print awareness worksheet where kids get to count! They cut & glue the words in the correct categories. There are 8 basic words in this activity. The words are: the, and, is, I, it, is, a & can. Here's a worksheet that does double duty! 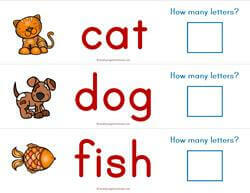 Kids learn that letters put together make words and ask how many letters are in those words? The words are: cat, said, see, look, four, one, blue, big. 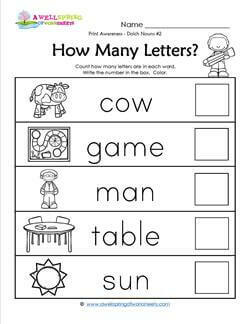 This worksheet has 4 and 5 letter words kids cut and glue in the correct category. The eight words are: jump, three, down, apple, funny, come, house, and here. Happy counting! 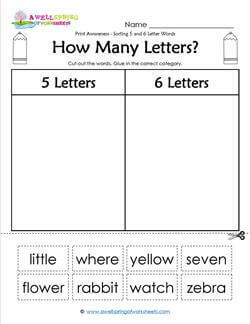 Our counting letters worksheet has 5 and 6 letter words that kids cut and glue in the correct category. Mixes concepts of print and counting. The eight words are: little, where, yellow, seven, flower, rabbit, watch and zebra. 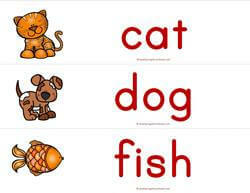 The words on this page of these four animal words are in a large type - cat, duck dog and fish. 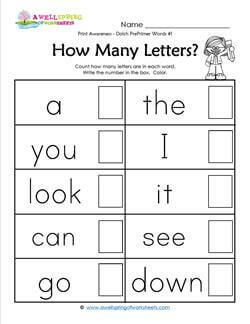 Kids count the letters and write how many. 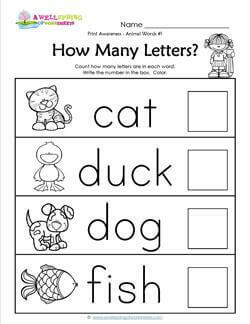 After counting the letters your kids can color the pictures of the animals. 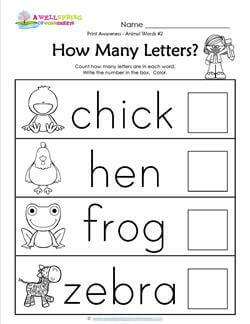 In this worksheet kids get to count the letters in these four animal words - chick, hen, frog, & zebra. The type is large so the letters are easy to count using one-to-one correspondence. 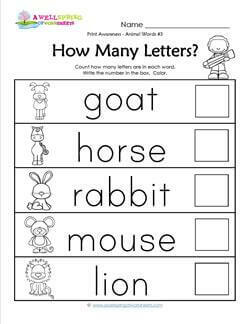 On this page kids get to count the letters that are put together to make these five animal words - goat, horse, rabbit, mouse, and lion. After counting, your kids can color the pictures of the animals. 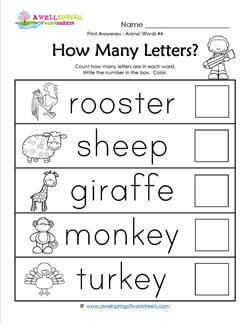 Another page where kids get to count the number of letters that are put together to make these animal words - rooster, sheep, giraffe, monkey, and turkey. After counting your kids can color the pictures. 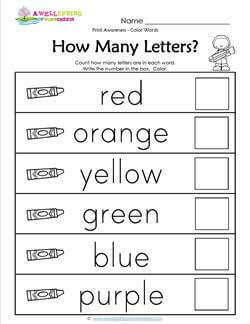 On this page kids count the letters in these color words - red, orange, yellow, green, blue, and purple (the colors of the rainbow). They write how many in each box. Then they try to color the crayons the color of the color words! Your kids get the opportunity to focus strictly on the words on this page. The Dolch preprimer words are - a, you, look, can, go, the, I, it, see, and down. These words are hard to represent with pictures, so there are only words. Page #2 of Dolch preprimer words kids can count. 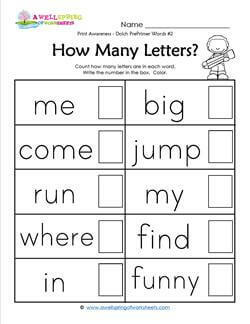 There are ten words on this worksheet - me, come, run, where, in, big, jump, my, find, & funny. Since these words are hard to represent with images, there are no pictures. 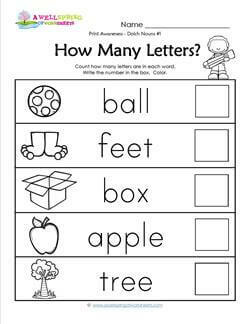 This worksheet has kids count the number of letters in the five Dolch nouns - ball, feet, box. apple, and tree. They write the numbers in the boxes and color the corresponding pictures. Check out this worksheet! 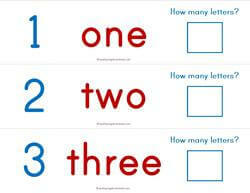 Kids count the number of letters in each word. These words happen to be Dolch nouns. They are - cow, game, man, table, and sun. Tackles both concepts of print and counting. 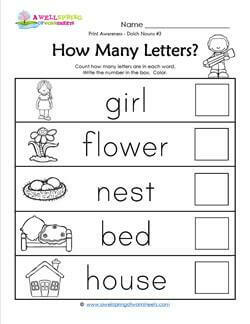 This worksheet has five Dolch nouns - girl, flower, nest, bed, and house. Kids count the letters in each word, write the numbers in the boxes, and color. Kids get another opportunity to count the number of letters in a handful of words. 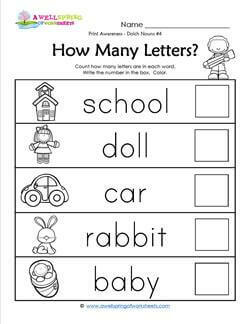 The words on this worksheet - school, doll, car, rabbit, and baby - are all Dolch nouns. Have kids count then color the objects. Here's a pocket chart activity for you! 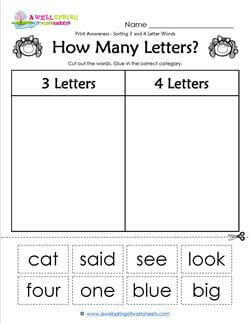 Kids read the animal words, count how many letters are in that word and sort by how many. The words have 3 to 7 letters. This 15 page set includes 21 cards with pictures, 21 cards without pictures and cards that have "3 letters", "4 letters", etc. Here's a nifty set of animal word strips you can pass out to your kids individually or on a ring. 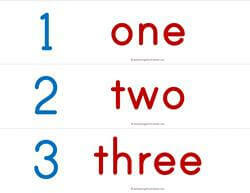 Kids read the words (if they can) and then count how many letters are in the word. They use a dry erase marker to write how many in the box. This is a pocket chart activity. 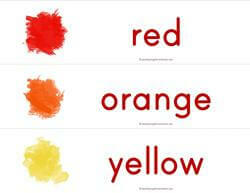 Kids read the color words, count how many letters are in that word and sort by how many. These words have 3 to 6 letters. This set includes 6 cards with pictures, 6 cards without pictures and cards that have "3 letters", "4 letters", "5 letters", and "6 letters". Here's some cool strips with color words. You can pass these out to your kids individually or as a set on a ring. 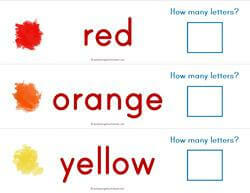 Kids read the words, count how many letters are in the color word and write that number with a dry erase marker. 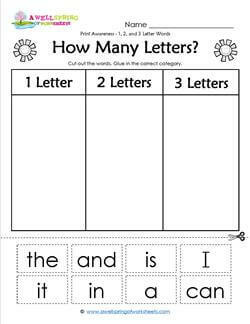 Kids read the number words (1-10) in this pocket chart activity, count how many letters are in that word and sort by how many. These words have 3 to 5 letters. This set includes 10 cards with the corresponding numbers, 10 cards without the corresponding number and cards that have "3 letters", "4 letters", and "5 letters". This set of strips has 10 number words on them. You can pass these out to your kids individually or as a set on a ring. 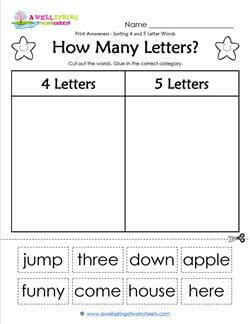 Kids read the number words, count how many letters are in the words, and write them on the card with a dry erase marker. Here's a pocket chart activity with Dolch nouns. 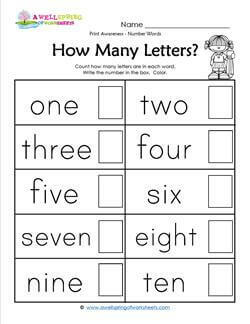 Have your kids count how many letters are in each word and sort by how many. These words have 3 to 6 letters. This set includes 45 cards with a picture, 45 cards without a picture and cards that have "3 letters", "4 letters", "5 letters" and "6 letters". This set of print awareness how many letter strips has 45 Dolch nouns on them. You can pass these out to your kids individually or as a set on a ring. Kids read the words, count how many letters are in the words, and write them on the card with a dry erase marker. 16 pages. Another pocket chart activity you could use over and over. Kids read the Dolch preprimer words, count how many letters are in each word and sort by how many. These words have 1 to 6 letters. This set includes 11 pages of 41 cards without a picture and cards that have "1 letter", "2 letters", an so on to "6 letters". This set of strips has 41 Dolch preprimer words on them. This set does not have any pictures to go with the words. Your kids read the words, count how many letters are in the words, and write them on the cards with a dry erase marker.